Within a country rich with cultural delights, gorgeous cuisine and beautiful countryside, Milan suffers a little reputation-wise as a destination to seek out. Not the poorer cousin, mind, rather the opposite, given the plethora of high-end fashion stores situated in the city that has an airport hanger with Emporio Armani in massive letters on the top. Rather more of a rep as the slightly glamorous but vapid cousin with a Chihuahua in their designer handbag. Indeed, if I didn’t have the option of free accommodation in the city courtesy of the boyfriend and his work meetings, as well as some free time before returning to work post-sabbatical, I can’t say I would have gone out of my way to visit Milan. Three days later, I was supremely glad I did. Sforza Castle is worth pottering around, even though I’ve seen better-laid out museums, as it’s only €3 entry and there are some stand-out pieces. As is typical in Italy, a lot of museums close on Mondays, not great if you’re spending a long weekend in Milan. However, the Museo Poldi Pezzoli opens on Mondays and is by far the best museum in the city. It originated as the private collection of a 19thcentury gentleman called Gian Giacomo Poldi Pezzoli and his mother Rosa Trivulzio and remains housed is the gorgeous 19thcentury mansion they lived in. The museum has a fantastic collection of art, antique furnishings, and armour within what are already eye-catching interiors. Look out for the koi carp swimming in the most ornate marble inside pond under the massive spiral staircase, as well as the ornate room decorated with a gold ceiling with medieval characters depicted on it, an elegant stain glass window and multi-coloured, patterned tiles – all to recreate a 14thcentury look. I also highly recommend admiring the cabinets (if I ever become rich I’m going to become a mad antique cabinet collector), the antique belt and the prettiest pair of scissors (I never realised one could think scissors were pretty until I saw that pair). Among the many things the Romans were famous for were their bath houses. So it seems fitting that a key thing you should do on a trip to Italy is re-enact that spa experience. And, set among the ruins of ancient Roman aqueducts, QC Termemilano lets you do that very easily and well. The outdoor hydrotherapy pools allow you to admire the ruins as well as the stars, if you’re headed there in the evening. While further hydrotherapy pools, a waterfall room, a rainfall room, various saunas and steam rooms, a hammam and a couple of relaxation rooms inside the more modern building (but mostly set within an underground floor with a curved ceiling and dark lighting that makes you feel like you are in the tunnels of a grand ancient building) all provide a stimulating and relaxing experience. Even if you are left wondering if some couples in dark corners of the pools are er stimulating each other. I recommend going in the evening for the novelty of seeing the ruins lit up while relaxing under the night sky in warm pools. It stays open until midnight too, which is great if you’re knackered after a late flight and want to recharge. I love shopping. But when I shop abroad, I find it disheartening to be confronted with the same brands I can just as easily access in London. Milan has whole arcades full of these from the big designers such as Prada down to high street options like Mango. So it was with great delight that I spent a lazy, sunny weekday morning wandering around the Brera district of Milan, taking in market stalls, discovering independent fashion and furniture boutiques and pop-up showrooms of artists’ works, all to be discovered along Brera’s cobbled charming streets lined with old, beautiful houses. 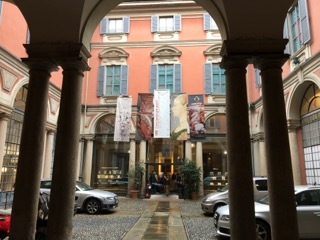 For jewellery hounds on a budget, there is a small market outside the Pinacoteca di Brera art gallery (amazing, if you like Lombardy art, I’m just such not a big fan) with several stores I couldn’t drag myself away from. Purchases included a pair of earrings made with a mix of leather and metals. If you see any of the big imposing wooden doors that line Italian streets in residential areas are open, do slow your pace to peek through the dark tunnel of the archway beyond to the bright courtyards and sophisticated homes beyond. It’s like looking into a painting.